ROME – An Italian side that, for the first time ever, featured a player born in the 2000s found a last-minute winner in a friendly against the USA on Tuesday night, avoiding going two games without a goal. After an incredibly frustrating 0-0 draw with Portugal on Saturday, it seemed that the wasteful azzurri were heading for the same result against the U.S. in Genk, before Inter Milan striker Matteo Politano found the back of the net with virtually the last kick of the game. Brought on with just three minutes of normal time to play, the substitute’s close-range strike in the 94th minute was the culmination of a completely dominant Italian performance which, until Politano’s intervention, had failed to result in a goal. Just as against Portugal, Italy were extremely wasteful in front of goal, failing to convert 16 of their 17 shots on goal, lacking a touch of quality amongst the forwards. However, manager Roberto Mancini’s fluid brand of football has begun to take shape on the pitch, with his side having 73 percent possession and controlling the tempo of the game from the midfield. There were impressive performances again from Marco Veratti and Nicoló Barella, the latter becoming quickly accustomed to life in the blue of Italy, despite only being 21. 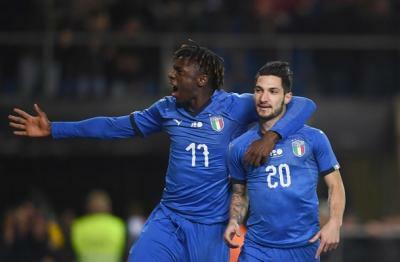 Mancini’s emphasis on the development of the younger generation was clear to see in Belgium, as he handed a substitute appearance to Moise Kean, a 19-year-old Juventus striker who became the first player born in the 2000s to feature for Italy’s national side. The combination of young prospects like Kean and seasoned veterans like Giorgio Chiellini, who didn’t appear against USA having won his 100th cap in the Portugal fixture, presents an exciting hybrid of youth and experience for this new-look Italian outfit. Mancini will have plenty of positives to take from his side’s Nations League campaign, despite finishing second in their group behind Portugal, but will have to address the lack of goals if Italy are to get through qualification for the 2020 European Championships.